I thought it would be a fun to show you some of the activities that our kids do during their therapy sessions. Debbie, our Occupational Therapist, is a master at using toys to encourage the kids to try new developmental skills. She has been doing therapy through play with the kids twice a week since they were six months old, and they love her! It's so cute to watch them wait for her at the window or wave goodbye as she drives away. While every therapy session is unique depending upon which kid she is working with, there is a core set of skills that all of the kids are working on right now. And since our kids have the attention span of gnats, most of the time she works with all four of them at some point during each session. 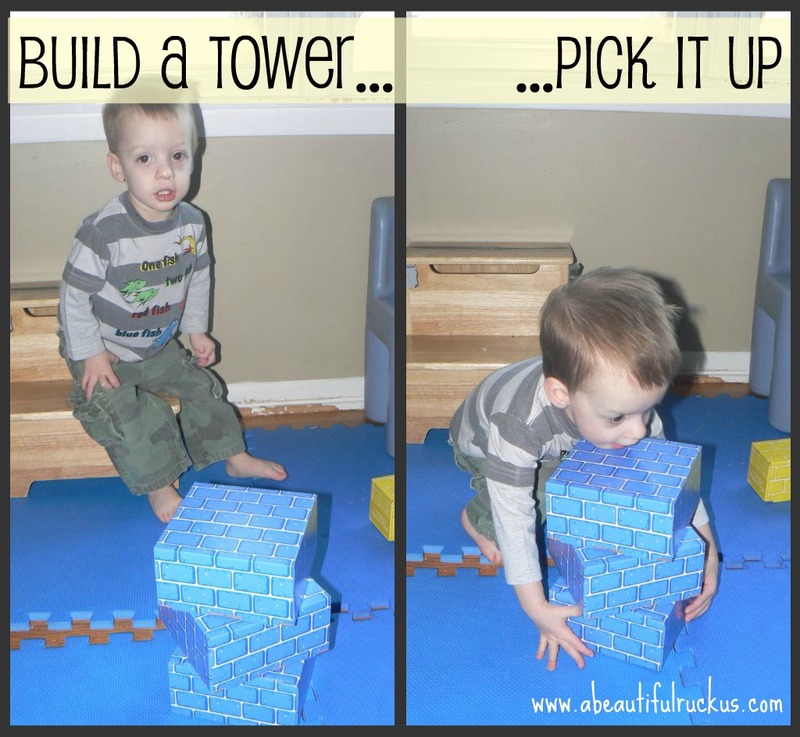 We recently got several sets of the Melissa and Doug Jumbo Cardboard Building Blocks for the kids to play with and they have been so much fun to use during our sessions! I decided to bring out the camera to document how we incorporate the same toy into lots of different exercises while still making it fun. It keeps the kids interested and also lets us have extended use out of our toys since we use them in structured and free-style playing. We are always so glad to see the kids exploring new things! We keep our blocks out in the garage and bring them in periodically. The idea is that the blocks stay fresh and entertaining so that the kids find the novelty worth pursuing. They definitely have to work hard during their therapy sessions so sometimes a little bribery is helpful! The kids are a hoot when the blocks first come out! The first thing they do is take all of them out, and then a lot of times one (or more) kids will climb into the storage box and empty the last ones from the bottom. 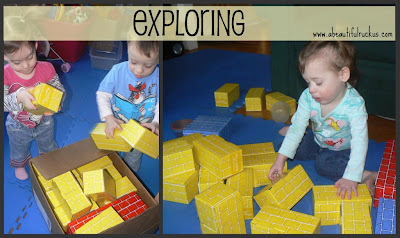 I'm all for encouraging exploration in a safe way and these blocks give them the opportunity to do that. They also provide a nice distraction from their need to explore the toilets, pantry racks, and electronic equipment (there is never any downtime here!). Stacking is one of the skills that we are working on right now. Normally the kids need some coaching and assistance with balancing items, but I turned around to find that Elijah had built a tower all by himself without any prompts. Proud Mama! Then, of course, there's Caleb who much prefers to knock down every tower his siblings try to build rather than build any himself....we will keep working on it though! 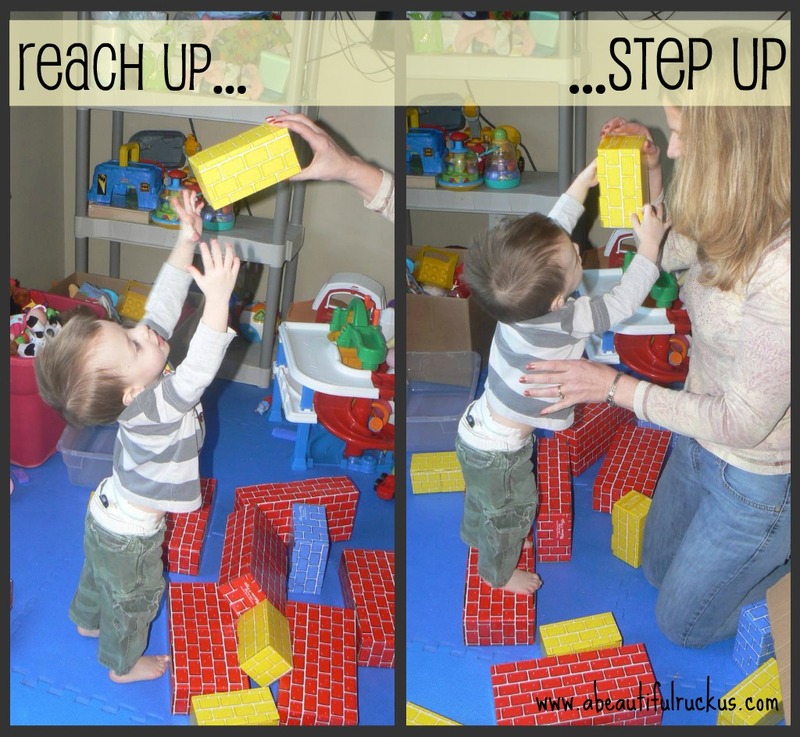 Stepping up is one of the biggest developmental skills we are working on with everyone. The end goal is that they are able to walk upstairs and downstairs while either holding onto the banister or using one hand to hold Mommy or Daddy's hand. The kids would much rather crawl up and down though, so it's a process to convince them to give it a try. (Hey, if it ain't broke...) We work on encouraging them to take that first step up with no assistance by asking them to reach for a toy while stepping up at the same time. It requires them to balance and focus simultaneously. This exercise definitely asks them to "step" outside their comfort zone. A couple of our kiddos struggle with clearing toys with their feet. Ellie and Caleb in particular try to walk around any obstacles in their path rather than navigate over them. 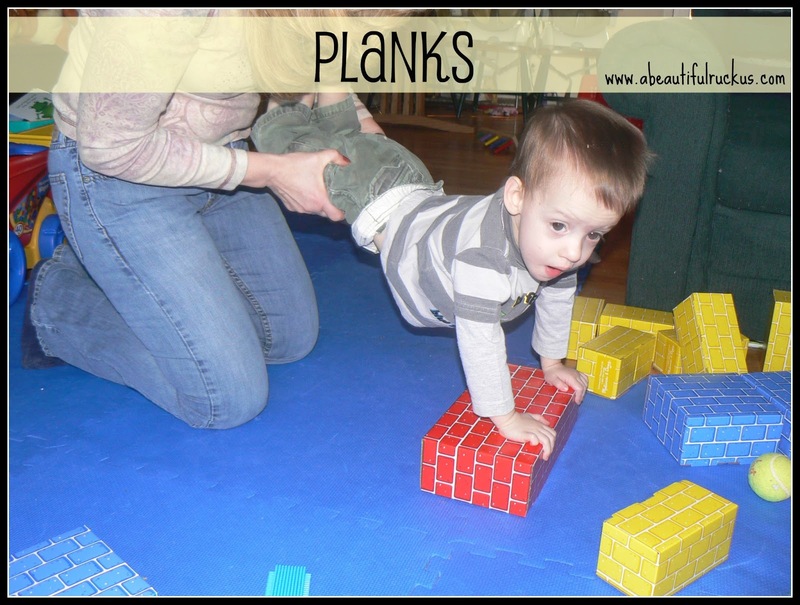 These blocks are awesome for creating obstacles of different heights and widths. Much better than pulling pillows off of the couch since those aren't nearly as interesting to toddlers! I took four of the big blocks (that hold up to 150 pounds!) and filled them with rice to weigh them down. After I added the rice, the big blocks weighed in at about 2 pounds each. Since the cardboard blocks are so light, I wanted some heavier ones to use for "stairs." Our real stairs are blocked by a gate (simply because I don't need four toddlers running rampant through the house) but that does pose a problem with their stair experience. Using the weighted blocks is a great way to get them some time on "stairs" without losing my sanity! My sweet boys have very little core strength. Because of that, they do a lot of planks. Giving them something fun to hold on to makes it more enjoyable for them. The picture doesn't show it, but we ask them to use their hands to "step off" and then "step back on" the block. It takes a lot of control and strength to do that, and honestly, they hate it. Having something brightly colored does help to make it more interesting. So if you ever wonder what we are doing on Monday and Wednesday mornings, now you know! We do a lot of variations of these exercises, but we try our absolute best to keep it fresh and entertaining. If you've ever done therapy yourself, you know it's not always pleasant. Thankfully, we are able to use toys to make it a little more interesting. Also, consider this a head's up: someday I'm sure they will have their stacking skills down and my living room will be full of block forts and flying stuffed animals. You've been warned! This post was sponsored by Melissa and Doug. Thank you for allowing me to sample your toys! This post may contain affiliate links. For more info, please see my disclaimer page. Was therapy recommended for your children? 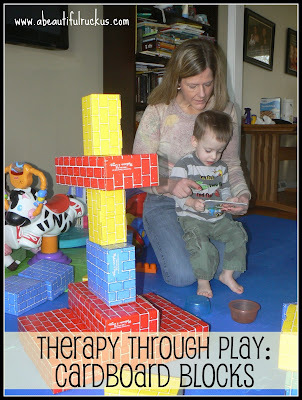 I am very interested in play therapy, not for my children, but I am studying to become a mental health counselor and working with children in play therapy is one of the areas that I am most interested in. It is great to see them coming along. Yes, we were referred to Missouri First Steps for evaluations and therapy. They are awesome, and we are so grateful for the services! Best of luck pursuing your Mental Health Counseling degree! Oh dear, you have four very bright children and I can see great potential with their cardboard block training. Stepping on empty boxes and falling inside, climbing over anything and everything, stacking pots and pans, picking up a sibling and you already know that Abby is a climber. Children see everything as a lark and you are teaching them great skills. Hope you aren't exhausted from laughing at their antics at the end of the day. They do keep us VERY busy! :) It's so fun to see them progressing and learning new skills! I love finding items that can be used in different ways! It not only saves money, it also saves space! I would definitely look into picking up a set for you son! I like that they can be used now for our kids and also as they continue to grow up. There are a lot of toys that aren't this versatile, it's nice to have something in my house that I know will last! It sounds like you have some big hurdles to overcome. Keep going, Mommy! Your son is blessed to have you on his team! This is a good method. Kids can entertain while developing their skills. At least they try to walk around an obstacle. Mine prefer to plow through and/or over anything in their way! Those blocks look like a good time. Haha! Not always! We have our fair share of plowing going on over here too! But the blocks help to create enough hurdles that they watch their feet a little more closely. When lockdown is over, we will have to have your kids over and have a block party! We are blessed to have their therapists in their lives! They are really wonderful! 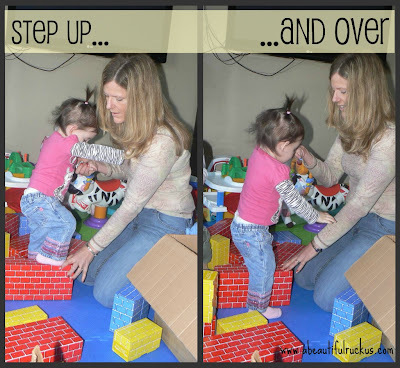 Your kids' OT is doing some great stuff with the blocks. I love your creative idea of adding rice to add weight to the blocks so you can use them as steps. Very creative and clever! Our kids love therapy too. It is nice for them to have such great opportunities for growth. 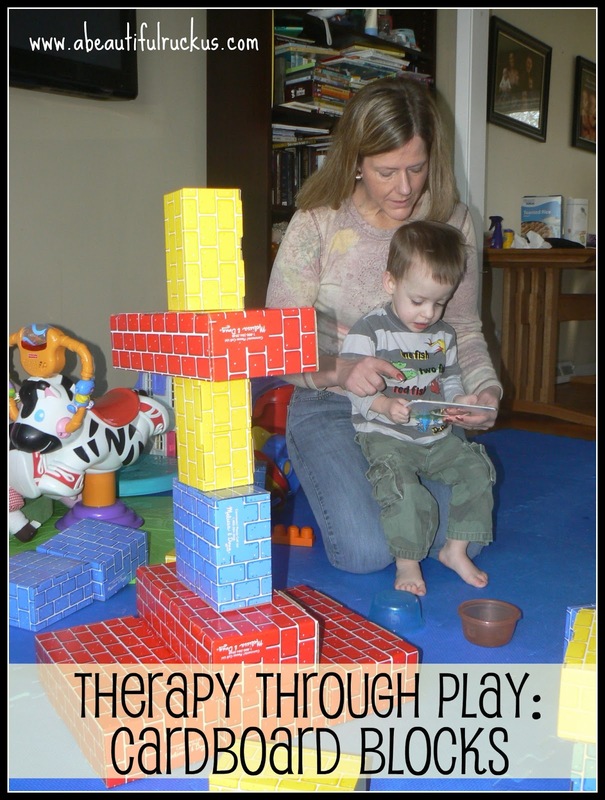 Their therapy sessions have made a world of difference in their development! I'm glad to hear that your kids are a fan of their therapy sessions as well! We have a set of these blocks and love them! I felt a little silly buying boxes, but the baby loves them. 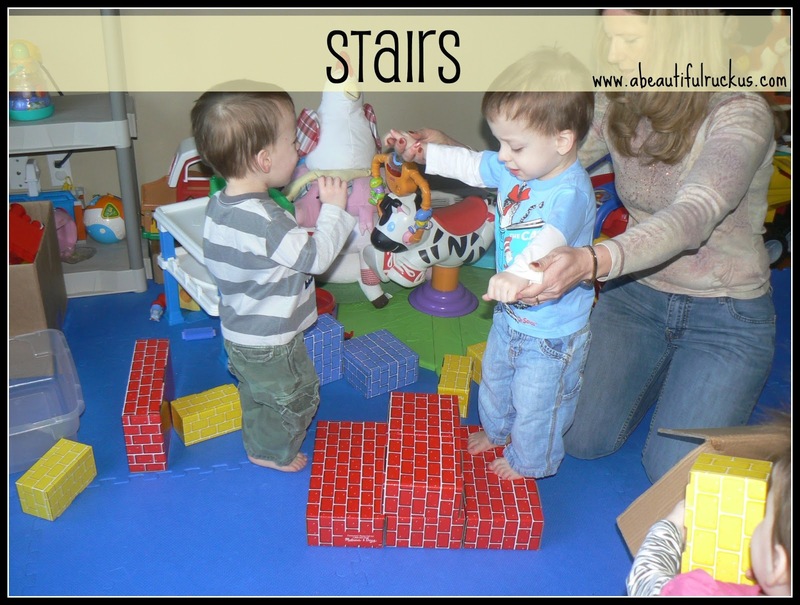 They're great for stacking, making stairs and general play- it's neat to see how they can be used for therapy purposes too. I definitely agree! They are worth having on hand because they are so versatile. I'm glad your family has discovered them also! Thanks for sharing this! We are always finding ways to use toys as therapy items. So much more fun than the official therapy items. And so much cheaper too! And it's nice because their parents can continue to do therapy with the items that they already have in their homes rather than buying offical therapy toys! I'm so grateful for our therapists being willing to work with what we have on hand!